In 1890, Répertoire Chromatique, by the French botanist and naturalist Charles Lacoutre (1832-1908), was published in Paris. Lacoutre was Professor at the Collège Clément in Metz and had already written many books on moss and other non-flowering plants when he presented his work on colours. 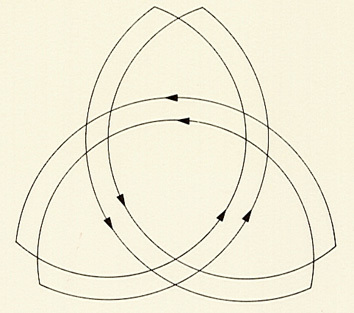 In Répertoire Chromatique, Lacoutre promised «reasonable and practical solutions» to the problems occurring with the multiple use — thus mixing — of colours, and constructed a figure which he called his «trilobe synoptique» which — if we translate the term with due respect — contains the three «ear lobes» which its name implies and provides a comparative view of colours. 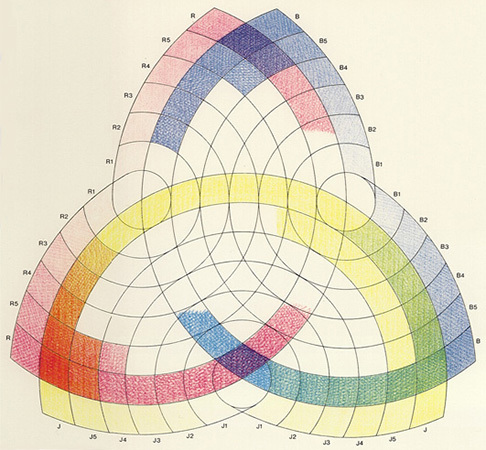 Lacoutre looked towards the three basic colours of red (R), blue (B) and yellow (J, jaune) and in his original 1890 figure uses these colours to plot the fine lines running in a bow-shape from the field J at the bottom left, for example, to the opposing field J at bottom right. Although not shown here, Lacoutre does not reproduce the various colour-hues and tints by altering the colour of the ink with which he works but varies both the thickness and the number of lines placed across his colour fields, in each case progressing from white in six steps: R1, R2 … R5. R stands for red, and accordingly B for blue and J for yellow (jaune). Each of the three primary colours appears as a generator of colour-fields, all of which overlap. 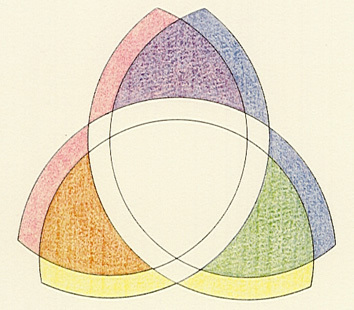 The primary colours on the edges of the three-lobed shape are effectively a register in which the central mixtures can be checked. The lines in this figure can be followed in the way shown, thus exploring all the colour fields until the start position is once again reached. Date: The naturalist Charles Lacouture presented his system of optical mixtures in 1890. Bibliography: Ch. Lacouture, «Répertoire Chromatique: Solution Raisonnée et Pratique des Problèmes les Plus Usuels dans L’Etude et L’Emploi des Couleurs», Paris 1890; «Color Documents: A Presentational Theory», organised by S. Wurmfeld, Hunter College Art Gallery, New York 1985.